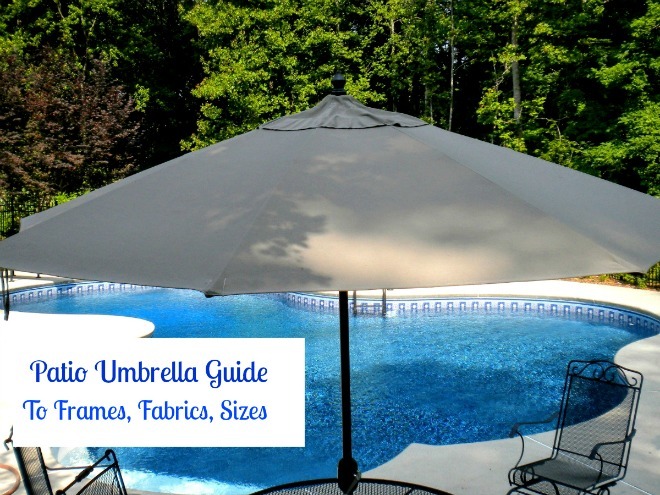 Your guide to outdoor umbrellas will help you in selecting the the most durable, fade resistant fabric, the right weight patio umbrella base, and the best size umbrella for different seating arrangements. With just a little forethought you can enjoy your patio umbrella season after season without having to replace it annually because the fabric has faded, the ribs have broken, or you find it too hard to open and close. Think about where your patio umbrella will be used, what are your opening/closing options, and how long you want to keep this piece of pool furniture to make the smartest buy that meets your needs. 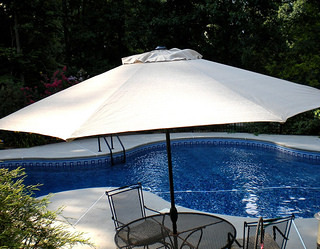 Pool umbrellas are a must around the pool, patio or deck. 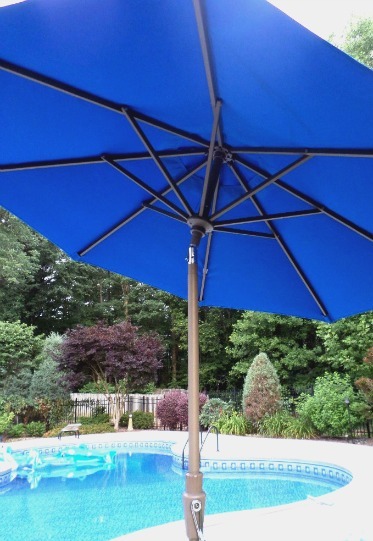 Our summers in Georgia, and especially the record heat of this summer, made our outdoor umbrellas one of the best pool furniture investments we've made - in fact we have 4 of them but our favorite ones are the ones made from Sunbrella fabric and Coolaroo fabric. They keep us shaded and cool in the hot sun and protect us if there is a light drizzle or rain. There are so many attractive styles to choose from. But before you buy your next patio umbrella there are a couple of things you should know, besides what color to chose. Outdoor patio umbrellas comes in 4 main different styles. 4. One that attaches to a Balcony or Railing. Decide where you will be using your outdoor umbrellas. 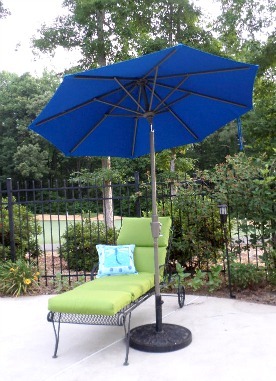 Freestanding umbrellas require a heavier base than those that go through a patio table. In our case we have 3 of them. We own two through a patio table and one small free standing one to provide shade to our chaise lounge. What Size and Shape Patio Umbrella? Outdoor umbrellas come in three basic shapes - round, square and rectangular. Trying to decide if you want a wood or aluminum patio umbrella frame? The frame consists of the pole, the ribs, the finial and the mechanism for opening and closing the umbrella. A patio umbrella frame comes in either wood, aluminum or fiberglass. A wood market umbrella offers a more classic look, but the aluminum frame is usually more durable and practical. How your umbrella opens is another important consideration. Being a total of 5' means that a manual lift with a pin and hole just isn't practical for me. 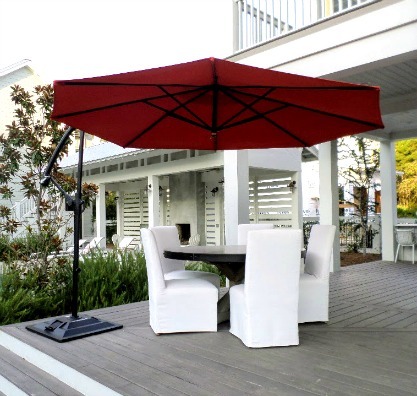 If your outdoor area is exposed to the sun for several hours consider getting a tilt patio umbrella. Before we took down 26 trees last winter, we had shade most of the morning and most of the afternoon. We didn't need the tilt feature then...but now the pool area is exposed to the sun most of the day (which is warming up our pool nicely). There are different kinds of mechanisms that will tilt your umbrella - the push button and crank mechanisms are the most popular. Patio table umbrellas need to protect you from the sun whether it's in the morning, noon or late afternoon. To get this full protection you need a sun protection umbrella that has an easy to operate tilt feature. Not all tilting patio umbrellas are easy to use - especially if you're 5 feet tall like I am. Sometimes the tilt mechanism is at the top of the pole - out of reach for me. A wood market umbrella provides a classic look to any pool or outdoor area protecting you and your guests from the hot sun and harmful UV rays. Most of them use a pin towards the top of the pole to keep the umbrella open. Remove the pin to close the it. 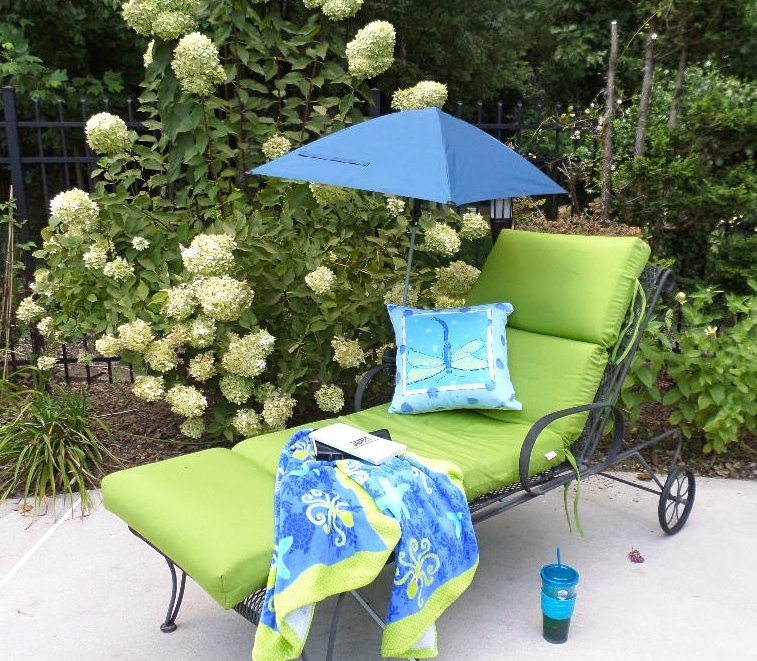 Do you think that all you need to know about patio umbrella fabric is the color you want? Well, think again. There's more to choosing fabric than just deciding on what color you want. Some colors fade more quickly and noticeably than others, some fabrics breathe better than others and some fabrics with a really tight weave keep you and your furniture protected when there's a light rain or drizzle. The two most common outdoor fabrics are Sunbrella and Coolaroo. We have both. Rectangular patio umbrellas provide the perfect shade for an oval or rectangular outdoor patio table or an outdoor seating area. They also work great where space may be restricted, like on a deck. Instead of a round umbrella, try a rectangle umbrella for better shade protection. They come in several different sizes. Just like for a round outdoor umbrellas, you will also need to measure the size of your table or seating area in order to purchase the right size rectangle patio umbrella. The shape and size of your outdoor umbrella is determined by the the size of your garden patio table or conversation area. Typically, your umbrella should be at least 5 feet larger than the area you want shaded. i.e. a 48 inch table (4 feet) needs a 9 foot umbrella. Besides size, the other features you want to consider before you make your purchase are a crank opening mechanism, a tilt feature and long lasting fade resistant Sunbrella fabric. The suggested weight for a rectangular patio umbrella base is 75 pounds or more. 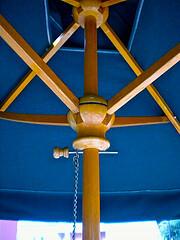 A cantilevered patio umbrella is another name for an offset or side post patio umbrella. 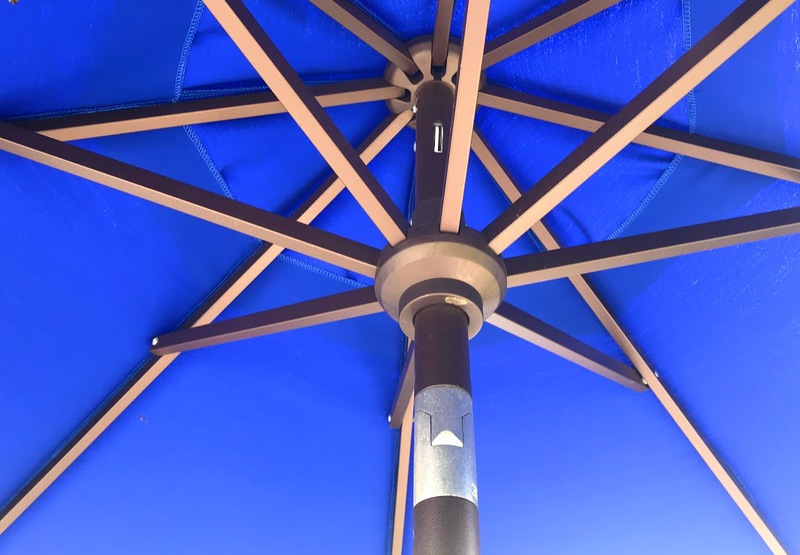 This type of sun protection umbrella works great for a sitting area that requires some shade or if you don't like the idea of a pole sitting in the middle of your table. Some of them can rotate making it possible to shade either your outdoor patio table or your outdoor seating area if they are in close proximity. Think you can just run to your favorite home improvement store and pick out the best looking umbrella base? That is if they even still have them and rarely can you find the right weight. You can't buy patio umbrellas without buying an outdoor umbrella stand. Well you can, but it just might end up in the pool like ours did. The main thing to know is what size or how heavy of an umbrella base is needed to hold the umbrella? It depends on whether the umbrella will be free standing or sitting in a table and what size umbrella you are buying. Generally speaking, error on the side of buying a heavier stand to prevent the outdoor umbrella from toppling over or being lifted by a heavy gust of wind. Patio umbrella bases come in a variety of styles and material. Some of them rust and last a short time and stain the pool deck while others look good for years. Ever find your outdoor umbrella sitting in your yard or pool? My neighbors and my daughter have all had their wood market umbrella ribs cracked when a gust of wind carried the umbrella out of the base and threw it into their yards. It may not be your umbrella's fault. As we say at work, it is probably "user error." 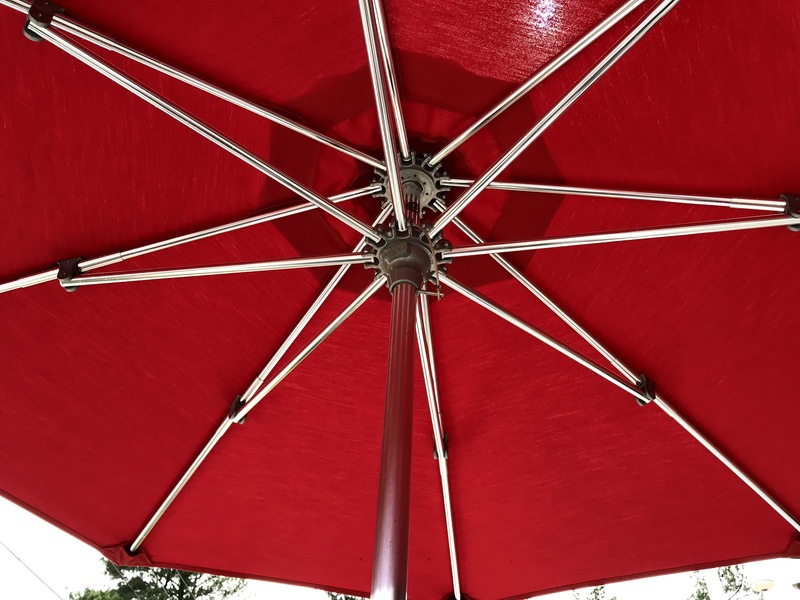 Most outdoor patio umbrellas get damaged when a strong gust of wind or a sudden storm pulls the umbrella out of the stand and sends it flying to the ground bending or breaking the ribs or pole. Or the strong wind just gets under the fabric and damages the ribs. Look for a vented umbrella that will help prevent "lift off." With a wind resistant patio umbrella, wood and aluminum ribs are replaced with fiberglass ribs which are very strong and resilient. 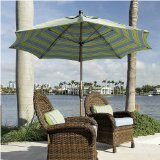 Their flexibility makes them ideal for a wind resistant patio umbrella frame. If you are looking to shade mostly your face and not your whole body, then simply use a clamp on umbrella like this one and attach it to your lounge chair. This clamp on umbrella by Sport Brella is the most adjustable one that I've found. It can be moved in so many directions and angles that your face can always be shaded. Easy to put on and take off and easy to adjust. We take it with us to the beach as well. Is the hole in your patio umbrella table a bit too large for your umbrella pole? 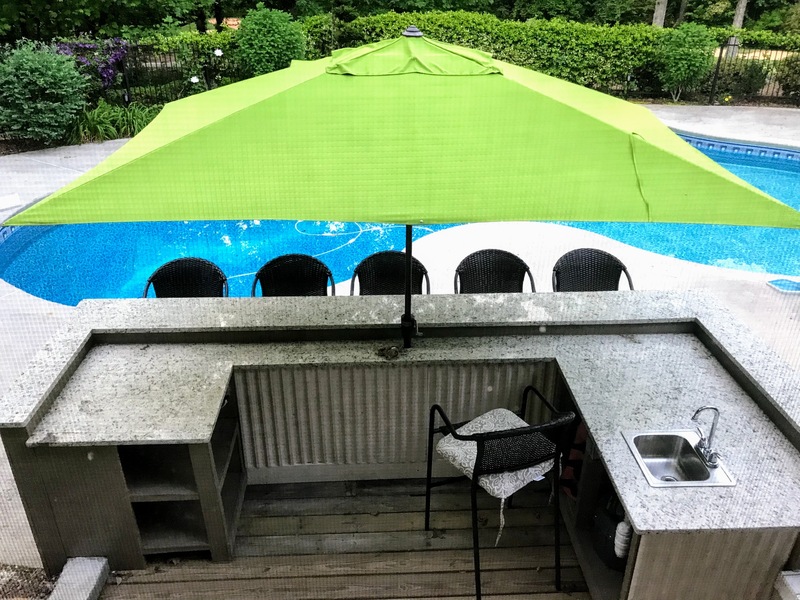 If you would like to stabilize your pool umbrella so that it doesn't wobble around especially if you have an outdoor glass table, then this handy gadget is for you. 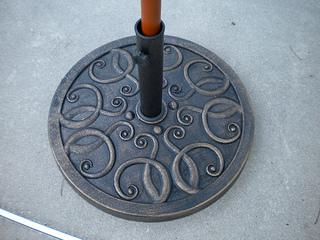 It doesn't replace a patio umbrella base - it just keeps the pole from moving around too much in the umbrella hole. My sister and her husband love theirs. They quickly bought one for their glass patio table when they saw how much the glass and the pole of their new umbrella was getting scratched. Not only has the wedge stabilized their umbrella but the rubber wedge provides protection to their glass table and umbrella pole. Slide the plug over the umbrella pole with the narrow end facing down. The tapered design means it will work in any table and pole combination. 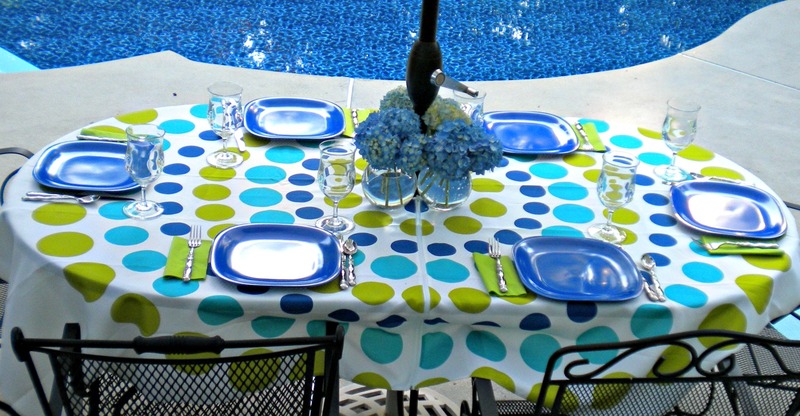 An umbrella tablecloth can dress up any patio table - get a solid colored one or one with stripes or checks. When there is a pole sticking in the middle of your table, you can't use your pretty round or oval tablecloths. I often used colorful placemats - until I found this great umbrella tablecloth at Tuesday Morning. A brightly colored tablecloth adds to any pool entertaining - whether the patio table is being used to serve food, appetizers, or desserts. This tablecloth with a split is hid by a zipper, velcro or tabs. With a hole in the middle of the tablecloth and a hidden zipper - these linens can accommodate just about any size pole. A patio umbrella table, like this resin wicker square one, serves double duty as an end table while offering shade to an outdoor lounge chair. The table measures: 21.65" x 21.65" x 17.72" with a powder coated steal frame. The table is not enough to weigh down the outdoor umbrella so add some bricks for extra weight. A great outdoor end table to put down food and drinks next to your lounge chair or sitting area. Outdoor umbrella lights include umbrella candleabras, solar lights, battery powered or electric lights. Depending on the mood you want to create you can use the lights for a quiet meal by the pool or something brighter for a rousing card game. 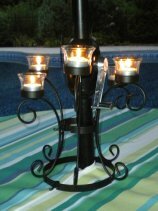 Patio umbrella lights make any evening out by the pool more enchanting and inviting. We love to spend time outdoors in the evening as well as during the day and having just the right lights for evening of entertainment and enjoyment is money well spent. Purchasing a patio umbrella that's the right size and shape for your table or seating area along with a few umbrella accessories, you will find yourself enjoying your outdoor patio or pool more frequently - entertaining friends and family or quietly relaxing in the comfort and shade of the perfect outdoor umbrella.